(Dar es Salaam) London School of Hygiene and Tropical Medicine (LSHTM) professor Wendy Graham on September 28 addressed Ifakara Health Institute (IHI) scientists in a talk entitled: “Improving maternal and newborn survival: opportunities and challenges in sub-Saharan Africa” during which she underlined progress in maternal health despite old and new challenges. 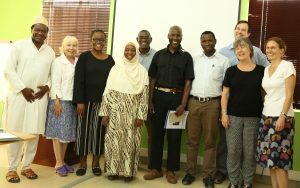 Prof. Graham along with colleagues from London school visited IHI during the week of September 24 – 28 2018 for the launching of the ‘Clean Study’. IHI’s Dr. Abdunoor Mulokozi is the Local Principal Investigator for the study. “Progress has been made in improving maternal health, including reducing maternal deaths,” she said during the talk she gave on Friday September 28 in the IHI’s Mikocheni Main Conference Room, acknowledging both old and new challenges facing the accelerated progress. 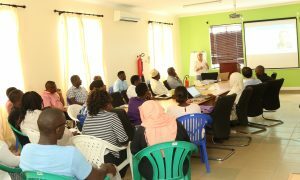 Among scientists who attended the scientific talk is former IHI and Costech director, Dr. Hassan Mshinda whom she worked with in the past. Others came from Muhimbili University of Health and Allied Sciences (Muhas) and CCBRT hospital. Wendy Graham is a professor of Obstetric Epidemiology at the London School of Hygiene & Tropical Medicine, & Emeritus Professor at the University of Aberdeen. She trained at Sheffield and then Oxford University, and has specialist interests in the prevention of healthcare-associated infections in mothers and newborns, with partnership projects currently in Ethiopia, Gambia, Myanmar, and Tanzania.